WARNING: Video contains strong language from the outset. 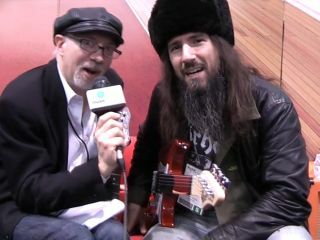 NAMM 2012: What would a NAMM show be without the engaging presence of Ron 'Bumblefoot' Thal? We don't even want to know. The ushanka-topped Guns N' Roses guitarist sat down with us for a most spirited (in both senses of the word) interview at the Vigier Guitars booth. Thal is, of course, one of the premier artists for Vigier - he has several signature models. We talked with him about his association with the company, and well as the just-completed Guns N' Roses tour, his solo work and how he's feeling after a surviving a most nasty auto wreck last year. He's quite a guy, as you can see in the above video.